Doesn’t everyone love enchiladas? Well, I have the best recipe for you! When I was looking for a healthy recipe website, I went to my Facebook friends. When a friend recommended Skinnytase.com, I was instantly hooked. This is my husband’s second time at making these, and both times they’ve come out amazing! HERE is the original recipe, and below are the details of our creation! We are huge fans of zucchini, so I bought two of each color for taste, and for looks. 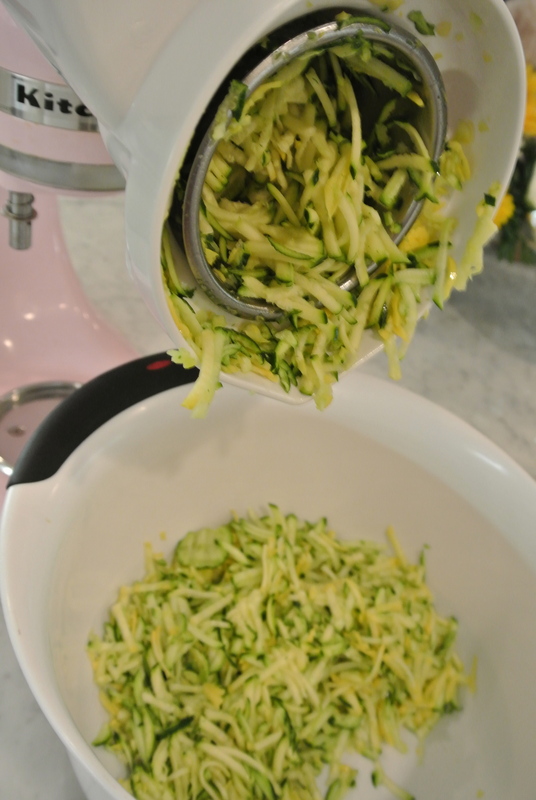 The first time I read over this recipe, I thought that it would be easier to chop the zucchini into cubes, but my husband came up with another idea and I’m glad he did! Thank goodness for our pink (hey, don’t judge me) KitchenAid mixer and slicer/shredder attachment because it can save you a lot of time. 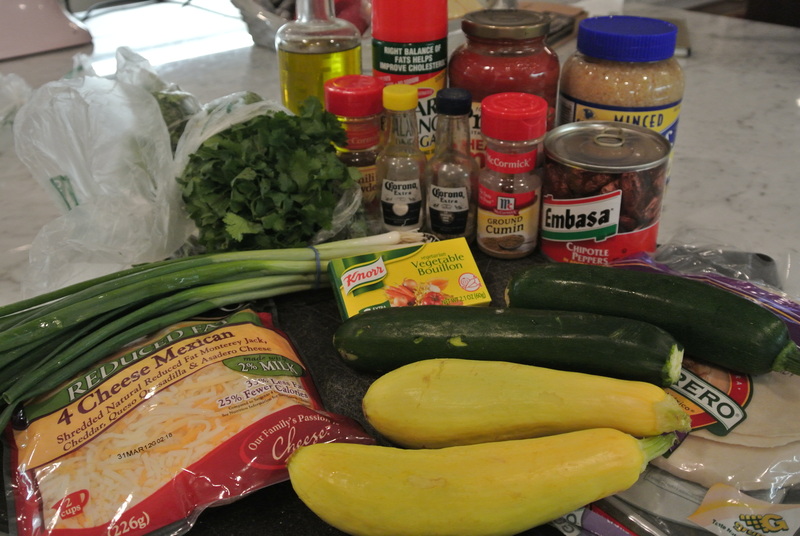 Also, the shredded zucchini creates a wonderful texture. If you don’t have a shredder, a mandoline will work just fine. I highly recommend you finding THIS exact kind of adobe sauce. It’s so good! 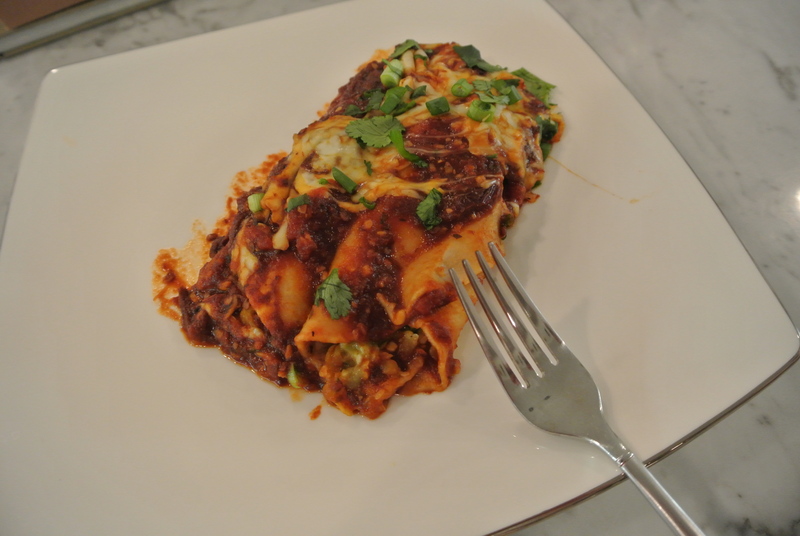 Since these enchiladas are meatless, this sauce makes for a wonderful replacement because the peppers are smoky, which gives off a meaty taste. The recipe says to put 1 tablespoon of the chilies into a pan, being from Texas and loving hot foods, we put half the can into the pan. Now, if you’ve ever heard of ghost peppers, you know how hot they are. If you haven’t, I’m warning you that these are the hottest peppers — EVER, and are dangerous to handle! Anyway, we added them into the already spicy adobe sauce. 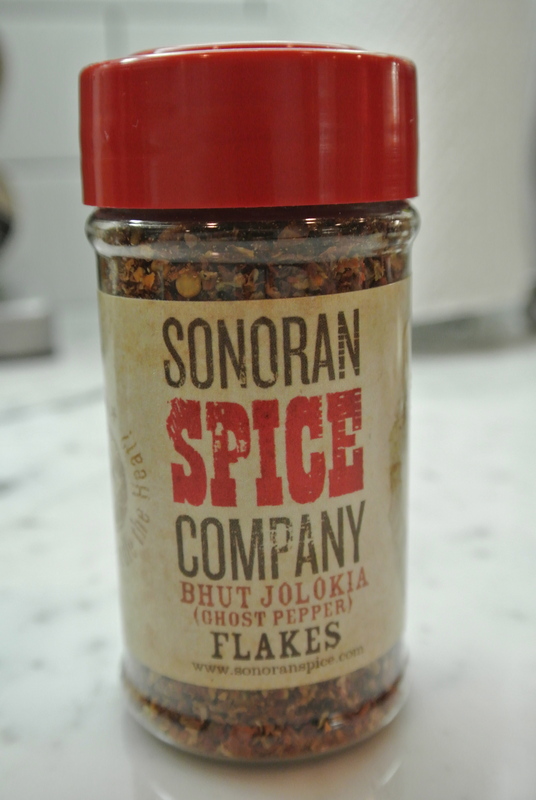 If you’re brave enough and are interested in purchasing a bottle of the Ghost Pepper Chili Flakes HERE is the link to where you can purchase them. When it comes to the tortillas, this is an important part. 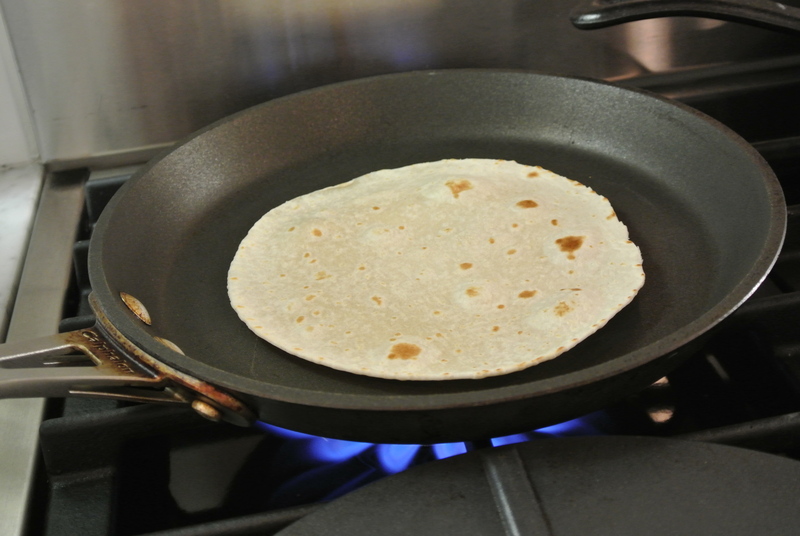 Nobody wants soggy tortillas, right? Sometimes we heat them first in the microwave but for best results we do something different. 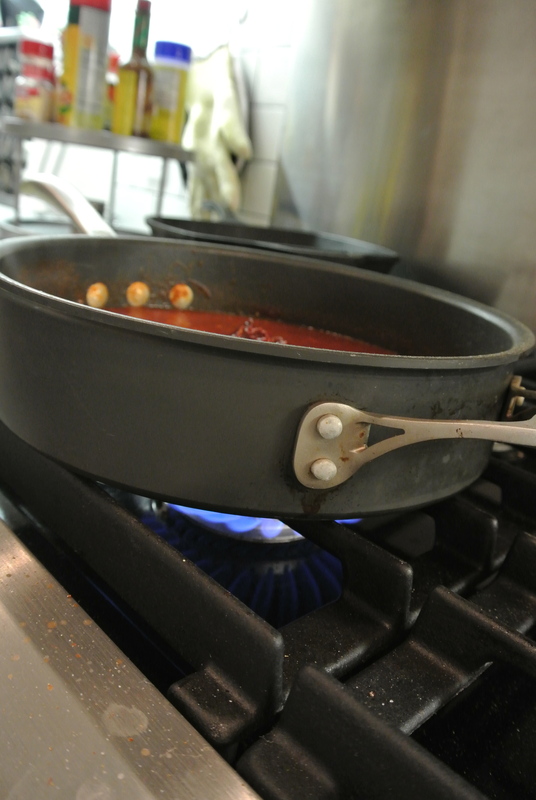 We put ours on a small skillet and wait until it bubbles up, and then flip it. 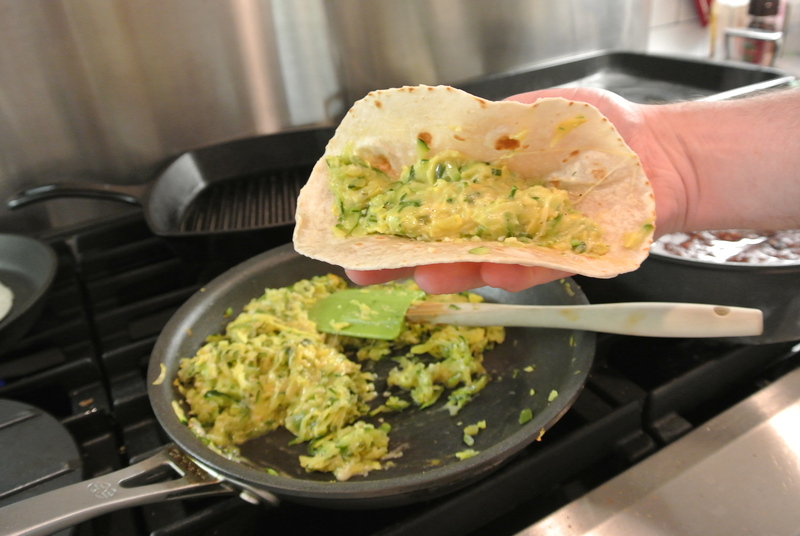 Now, comes the fun part, filling the tortillas with the zucchini and cheese mixture. Be sure that you don’t fill them with too much mix because they can be difficult to wrap. We fold them in thirds, but you can fold the ends together too, whichever you prefer. 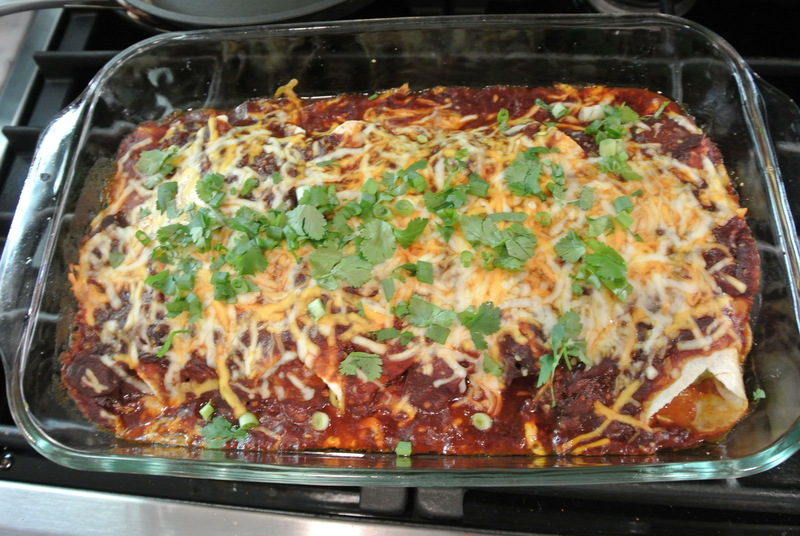 As you can see, we placed the enchiladas up. This is because after they’ve been in the oven, it’s easier when plating them so that they won’t tear or fall apart. Are you getting hungry yet? After you put on the adobe sauce and cheese, then put them in the oven and wait for this delicious meal to be finished in about twenty minutes! Don’t they look good-I mean great?! 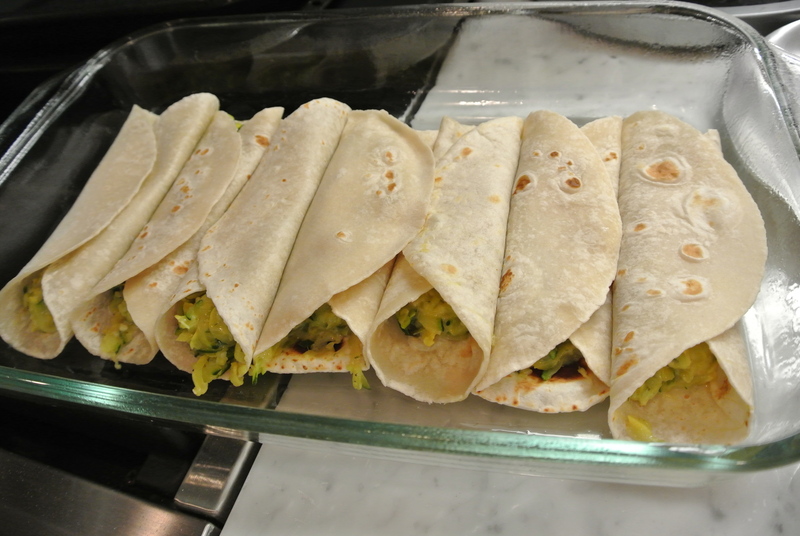 When you pull these out of the oven, sprinkle cilantro and scallions, and even sour cream, and enjoy your meal! The night we made these enchiladas, we were out of margarita mix (we use Zing Zang), so I had to settle on a beer. 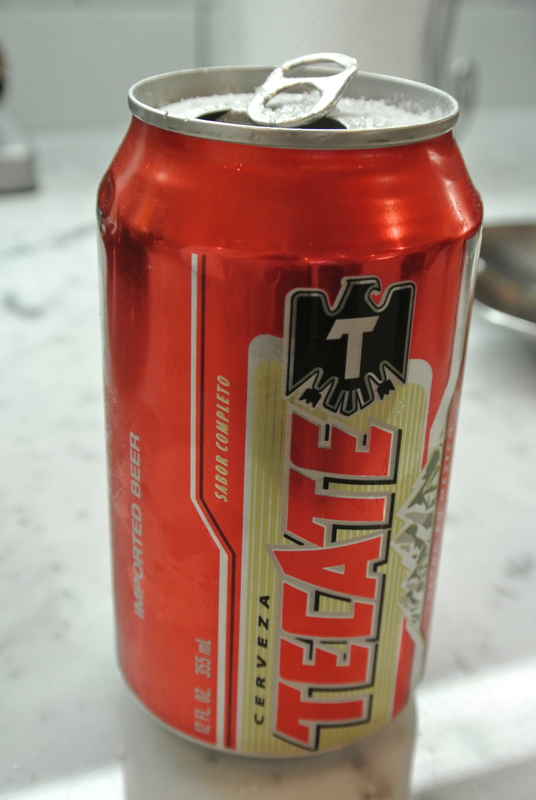 Now, pop the top on a Tecate (or other Mexican beer) and enjoy your meal.